The AMIGO suite. Image courtesy of The Ferenc Jolesz National Center for Image Guided Therapy. by Simon Drouin, Postdoctoral Fellow in the Surgical Planning Laboratory at the Brigham and Women’s Hospital and Harvard Medical School in Boston, MA. I got a first glance at the AMIGO¹ surgical suite while visiting Boston for a conference in 2016. 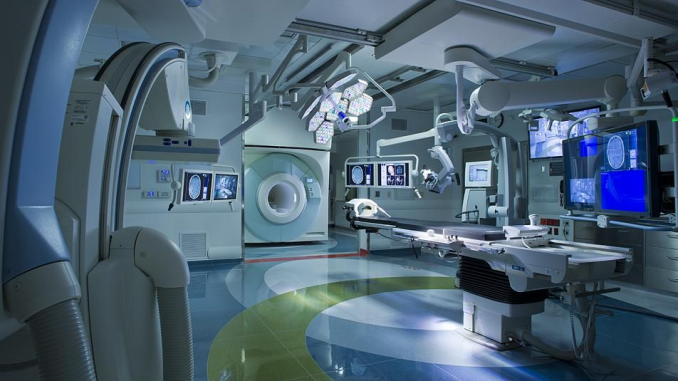 Like every other geek in the group of visitors, I was very impressed by the facility: a high-tech operating room many times the size of the ones I was used to, equipped with every piece of cutting edge machinery I dreamed of using in my research projects. On one side of the OR, large doors make way for a ceiling-mounted MR scanner that can be rolled-in to acquire images without moving the patient. On the other side, a PET-CT. What is striking about this operating room is the care that was taken in designing the space. Every piece of equipment, including a c-arm, the navigation system console and several large monitors are mounted on the ceiling allowing the room to be easily reconfigured by manipulating the articulated booms holding the equipment and avoiding the usual clutter of cables on the floor. A large console outside the room is connected to an array of remote-controlled cameras and surgical equipment and every video source can be dispatched to every monitor in and out of the room so that each aspect of an operation can be observed, recorded and measured from anywhere. Everything is carefully labelled and marked — down to the Gauss lines inlaid into the floor to indicate the strength of the magnetic field around the MR scanner when it is rolled in. While visiting the AMIGO surgical suite, I felt like a kid in a candy store — amazed by all the equipment and excited about all the research possibilities. On my way back home I kept thinking about everything I could do with access to this 25M$ wonder. Sure, the tech is amazing, but what stuck in my head is one sentence our host nonchalantly slipped in during the visit: “…by the way folks, this space is reserved for research every Friday. No operation is taking place on that day, the floor is all ours”. I felt like this was essentials for me to accelerate my research in image-guided surgery. In the past couple of years, I had wasted countless days in the OR trying to collect data that proved unusable because of a mistake in the manipulation or even simply failing to properly install the material needed for my experiment because of a misunderstanding on the functioning of the OR equipment. I thought “If I could spend that day a week by myself in the OR, making sure the equipment I plan to bring in is compatible with other machines in the room and rehearsing the procedures to avoid mistakes on the day of the surgery, I could do so much more”. As luck would have it, last September, I joined the Surgical Planning Laboratory at the Brigham and Women’s hospital as a postdoctoral researcher and started spending those Fridays in the OR and attending as many surgeries as possible. The experience proved even better than I initially expected. I found OR personnel that is dedicated to research and greatly helps with getting settled in; I’ve never felt so welcome in an operating room before. Then I discovered an additional benefit: technicians from equipment providers also use those Fridays to update and service their machines. You get to see the inside of a Zeiss microscope for example or get a scoop about what is coming up in the next upgrade of the BrainLab navigation system. This is extraordinarily valuable information when planning future experiments for your own projects. The technical sophistication is only one of the aspects that makes the AMIGO suite such a great place to conduct research on image-guided surgery. It wouldn’t be what it is without the rich ecosystem that has evolved around it. Of course, all that fancy equipment does help too. ¹ AMIGO is Brigham and Women’s Hospital’s Advanced Multimodality Image-Guided Operating suite, a unique clinical translational research platform for the validation of novel methods for improving patient care. This facility is used both for research and for clinical procedures, including neurosurgery for tumor resection. 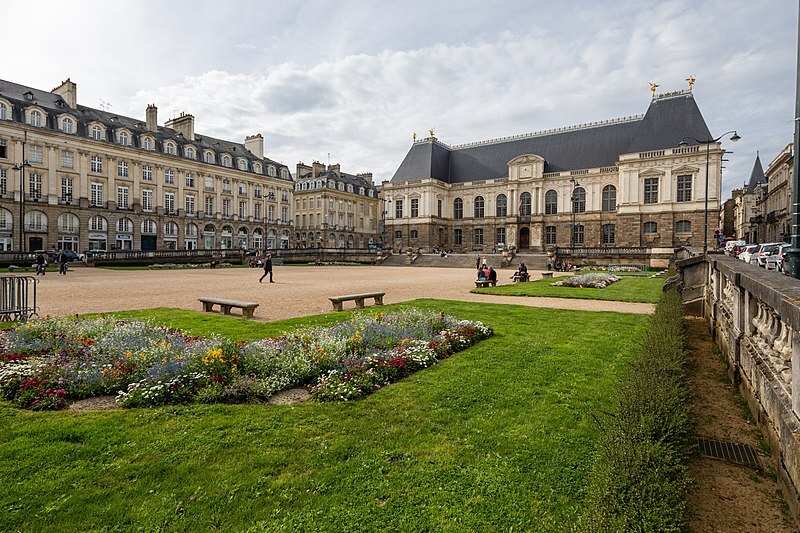 Join us in Rennes for the next ISCAS conference that will take place June 17-21 2019.